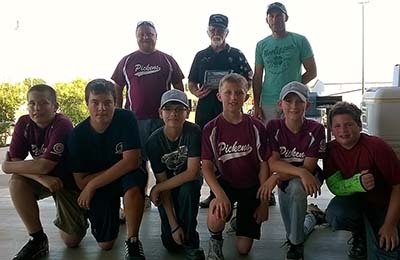 American Legion Post 149 member Joe Weaver (center) proudly holds plaque presented to the post by Pickens County Rec Department Little League baseball team Warriors. 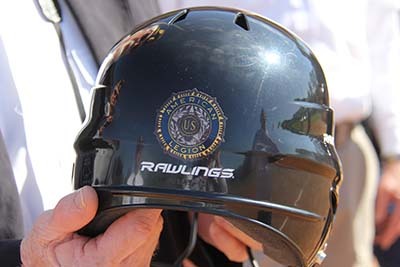 The plaque was in appreciation for sponsoring the team and the support of legion members during the ball season by cheering them at games and providing necessary safety equipment. Recognizing safety was important for the kids, the Legion purchased enough helmets for all of the Pickens county teams. American Legion Post 149 is all about veterans helping veterans. But that is not the entire story. They are also there to help support the community. The projects are numerous and varied... assisting young and old... and answering the calls for help as needed. The most recent outreach for community support was the sponsorship of one of Pickens County Recreation Department Little League Baseball teams. Post Member Joe Weaver proposed sponsoring a team to the membership last spring. "We had wanted to become more involved with our local youth and baseball was a great way to do it," spoke Weaver. Dubbed the "Warriors" the, team of 11-14 year old boys were soon proudly wearing their burgundy and white jerseys with the legion name on the sleeve. Throughout the season many of the legionnaires cheered from the stands as they watched their team play. It was soon learned that there was a shortage of batting helmets in all of the Pickens teams. Recognizing safety was important for the kids, the Legion purchased enough helmets for all of the Pickens county teams. The season ended with the Warriors finishing third in their standing. Coach Shane Johnson, a first-time coach and parent in the league, was proud of his team and feels next year will be even better. "I really enjoyed working with the boys and parents. It's so rewarding to see them learning and get so much out of it... sort of like watching a light bulb light up." Legion members had a final season goodbye last week for the team with a hot dog/hamburger cookout enjoyed by several of the team members and their parents. After Coach Johnson presented special trophies and medals to the team, they surprised the Legion members with a presentation of their own. A beautiful plaque with photo of the team and special thanks was presented to the legion and was accepted by Joe Weaver. Post Commander Ron Wheeler stated that Joe was the main man behind getting the legion involved and until a permanent facility for the post is found, Joe would have the honor of displaying the plaque. To find out more about Post 149 or if you are a veteran in need, call the legion hotline at 706-253-1715 and leave a message. Someone will return your call as soon as possible. Or email your questions to americanlegionpost149@gmail.com.